The most stunning and unique historic venue, beautifully presented. Sweeping views of the majestic Tamar River and beyond. Close to Launceston (35/40 minute drive north). It is an easy picturesque drive from Launceston CBD and the airport for you and your guests. Amazing photographic opportunities; sweeping vineyard & circular lawn views to the water, boatshed & deck with the water lapping up, magnificent restored 1850s stone barn, historic garden with the most beautiful mature European trees & breathtaking historic manor house (external back drop only, no internal access to the main house). Many options of comfortable luxurious accommodation in the precinct and surrounds if it is a destination event. The weather is better than you think! We hosted an autumn wedding in April of 2018 and the day temperature was about 20 degrees and stunningly clear and the evening around 14 degrees. Summer is great & Autumn & Spring have their own distinct colours and significance throughout the property, vines and gardens. Winter can certainly be cool but really romantic. Of course, no guarantees unfortunately!! Destination Tasmania! Wow, Tasmania has become one of the most sought after destinations due to its incredibly good ‘clean and green’ reputation and has become a food and wine hot spot with the most excellent restaurants (and caterers) and a growing reputation as some of the best wine in Australia. And the local sparkling wine, (which of course one must have at an event!) has an amazing world wide reputation of excellence. We produce delicious award winning wines of which you will have access to as part of your event package. 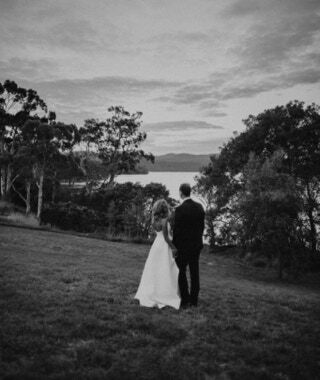 It was such an honour to have our wedding at the beautiful property of Waterton Hall. The round lawn location for the cocktail hour provided picturesque scenery of the vines and the beautiful Tamar River. This historic property provided many beautiful locations for photographs and was the perfect backdrop to our wedding reception celebrations. We have beautiful pictures taken down by the river but also in between the vines. The restored barn set the perfect mood for the formal reception, and the logistics were managed seamlessly by the Waterton Hall team and the contractors. We highly recommend the property and the team at Waterton Hall, we had an amazing wedding! We would love to chat about your special event. Sign up to our newsletter to access our great specials!